This product contains four independent tools: QuickRWall, QuickFooting, QuickMasonry, and QuickConcreteWall, you may install them all or pick and choose which products you wish to download. They are licensed independently. A stand alone tool of masonry components to manage multiple structural components within a single project file. The QuickMasonry "Project Management" tool offers the ability to design a whole series of lintels and walls, for a single building in one project file, following the latest masonry design specifications and offering a host of impressive features. Concrete spread footing (single column pad), imports from VisualAnalysis. Design and check reinforced concrete footings under a single column without building a complex analysis model of the building. Will check several footings all at once (for worst case). Automatic sizing and detailing (optional). Checks footing, pedestal, and interface. Stability checks: Bearing pressure (net & gross), overturning, sliding, and uplift. Accurate calculation of bearing pressure under biaxial loading. 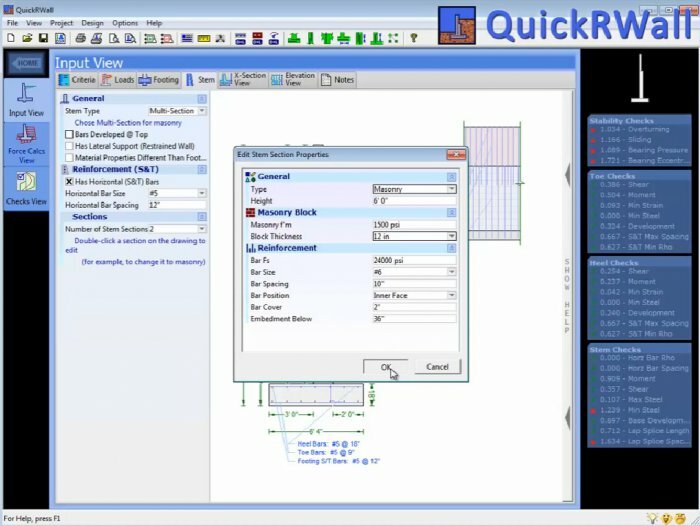 QuickRWall is perhaps the best tool on the market for retaining wall design! It will get you out of the 'black box' and into high-quality wall design in short order. The reports are excellent with full equations and intermediate data readily available for complete checking. 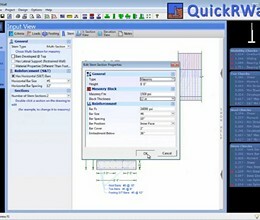 QuickRWall is very graphical, extremely easy to use, fast, and robust. QuickConcreteWall specializes in reinforced concrete shear walls and is an excellent tool for detailing a concrete wall subject to in-plane forces. Complex ACI interaction checks are done instantaneously as you tweak design parameters and view the results. Complete rebar detailing is provided in a productivity-quick format. * QuickSuite download link provides trial version of the software. QuickSuite has been rated 2.3 out of 5 points. A total of 3 votes cast and 0 users reviewed the software.